Silver Birches is home to a collection of thirteen vintage structures with varied histories, dating back to the 1920s. The choices for lodging are broken down into three categories: guestrooms, cottages, and houses. 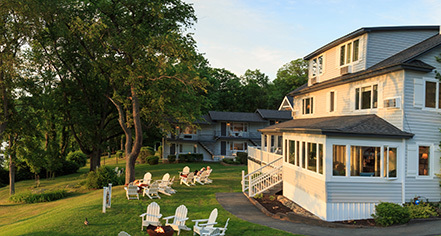 All buildings face the nearly 700 feet of shoreline on Lake Wallenpaupack and offer views of the lake. Many have porches, decks, balconies, fireplaces, and whirlpool tubs. All of the guestrooms have undergone a complete renovation in 2016. All of the buildings and cottages received an exterior upgrade as well. Guestrooms are housed in five buildings and offer a wide variety of accommodations. All rooms have a view of the lake. Silver Birches is located on the shoreline of Lake Wallenpaupack, a freshwater lake the Pocono Mountains, in northeastern Pennsylvania. The area features hundreds of acres of forest lands, wildlife, walking trails, campsites, and boat slips. Outfitters offer kayaks, water skiing, parasailing, wakeboarding, jet skis, and boats to make the most of the experience. Silver Birches, a member of Historic Hotels of America since 2016, dates back to 1929. The Inn is the cornerstone of Silver Birches and the oldest structure on property; it is the original farmhouse, dating back to the 1920s. Airport Transportation: None provided by the hotel; shuttle can be arranged by concierge upon request. Cancellation Policy: Off-season: Cancellations must be made 72 hours prior to arrival to avoid loss of deposit. High season: Cancellations must be made 3 weeks prior to arrival to avoid loss of deposit. Deposit: 50% deposit due at time of reservation. Early Check-In/Late Check-Out: Early check-in: Subject to availability. Complimentary if available. Late check out: Half day rate. Hotel/Resort Fees & Taxes: No resort fee applies. All reservations may be subject to a 9% hotel tax. Pet Policy: Service animals allowed: Yes. Pets allowed: Yes. Amenities: Included in package. Services: Max’s Wagaway. Restrictions: Maximum amount: 2 pets per room. Fees: Included in package. Smoking Policy: Non-smoking or vaping property. Learn more about the History of Silver Birches .